Chilli Pepper and Zahra Media Group have merged their expertise to create Ireland’s only dedicated loyalty magazine, All About Loyalty. The magazine is essential reading for loyalty, retention and content innovators everywhere, who are looking to retain their existing customers and drive more loyalty from them. All About Loyalty promises to bring you up to speed with the ever changing world of loyalty and most importantly helps to join the dots between customer loyalty and custom content which is proven to increase brand loyalty by up to 32%. With many businesses in Ireland moving towards developing stronger retention and loyalty strategies, the magazine is here to help you keep abreast of trends, strategies and metrics from around the globe. 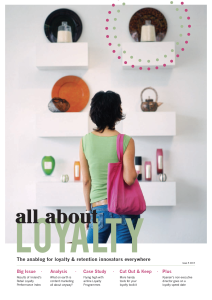 As a result, All About Loyalty has interviewed some of the leading global brands to gain an understanding of the strategies that they use to gain customer loyalty. These include, Red Bull, L’Oreal , Bentley, Porsche and American Express to name a few. A journal with reflections, comments and pointers to further resources, delivered in an analogue format, i.e. on paper. A contraction of the phrase “Analyst Blog”. Specifically, a blog of someone who analyses sectors of an industry. Someone turned to for informed opinions on a given subject, particularly subjects related to current events. With a significant increase in interest for effective strategic customer loyalty and content marketing, All About Loyalty is constantly finding new ways to help our readers keep up to date with these two fascinating areas. Ireland: €39.95 incl. posting and packaging. Rest of world: €45.00 incl. posting and packaging. Leanne Papaioannou is the founder and Managing Director of Chilli Pepper, Ireland’s only dedicated strategic customer loyalty agency. We specialise in helping businesses devise, implement and manage all aspects of their customer loyalty, experience and engagement strategies. To speak to Leanne directly, contact her on +353 1 531 1421.